Simplicity and elegance combine in the perfect lines of the Centra espresso wall cabinet by the Wyndham Collection. If cutting-edge contemporary design is your style, then the Centra is for you -- modern, chic and built to last a lifetime. Featuring soft-close concealed hinges, you'll never hear a noisy door again. One interior adjustable shelf allows space customization and one exposed lower shelf offers unhindered access to frequently used bath items or provides a delightful way to showcase collectibles or decor pieces. It comes largely pre-assembled to expedite setup and installation. Wall mount cabinet with genuine marble top. Full extension drawer glides with brush nickel finish hardware. Dimension: 15Wx13.8Dx16.25H * Birch* Black * Nickel finish hardware* no assembly required Faucet and mirror not included. Professional installation recommended. Wall mount cabinet with white phoenix stone top. Full extension drawer glides with brush nickel finish hardware. Dimension: 15Wx13.8Dx16.25H * Birch* Black * Nickel finish hardware* no assembly required Faucet and mirror not included. Professional installation recommended. Centra 24-inch W x 29-inch H x 8 1/2-inch D Bathroom Storage Wall Cabinet in Espresso Simplicity and elegance combine in the perfect lines of the Centra espresso wall cabinet by the Wyndham Collection. If cutting-edge contemporary design is your style, then the Centra is for you -- modern, chic and built to last a lifetime. Featuring soft-close concealed hinges, you'll never hear a noisy door again. One interior adjustable shelf allows space customization and one exposed lower shelf offers unhindered access to frequently used bath items or provides a delightful way to showcase collectibles or decor pieces. It comes largely pre-assembled to expedite setup and installation. 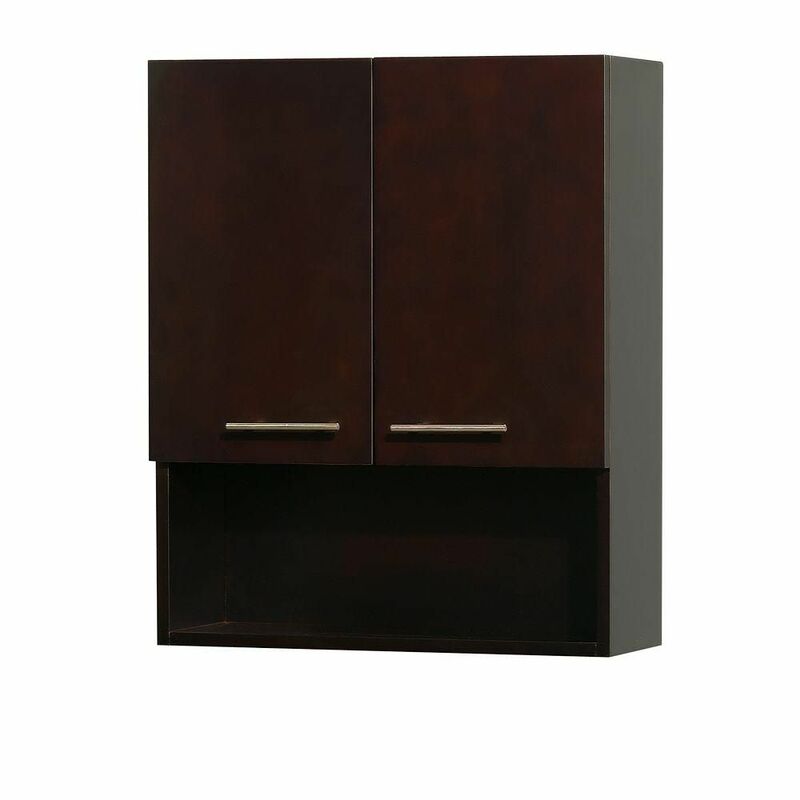 Centra 24-inch W x 29-inch H x 8 1/2-inch D Bathroom Storage Wall Cabinet in Espresso is rated 2.0 out of 5 by 1. Rated 2 out of 5 by Anonymous from Ok cabinet This cabinet is okay. Some of the joints are not completely painted. The handles are not attached so you have to drill holes and attach the handles yourself. For a cabinet this expensive you would think the handle holes would already be drilled.